Street sales didn’t add much to the bottom line of most of the newspapers where I worked, but they did add a bump that pushed up the average circulation upon which advertising rates could be based. So attention had to be paid. When he was executive editor of The Washington Post, Ben Bradlee noted with wry amusement that sales of the Monday paper went up when there was a headline over the nameplate about the Redskins game the day before. Never mind that by then the score was hardly news anymore. So he kept on putting that banner up there. 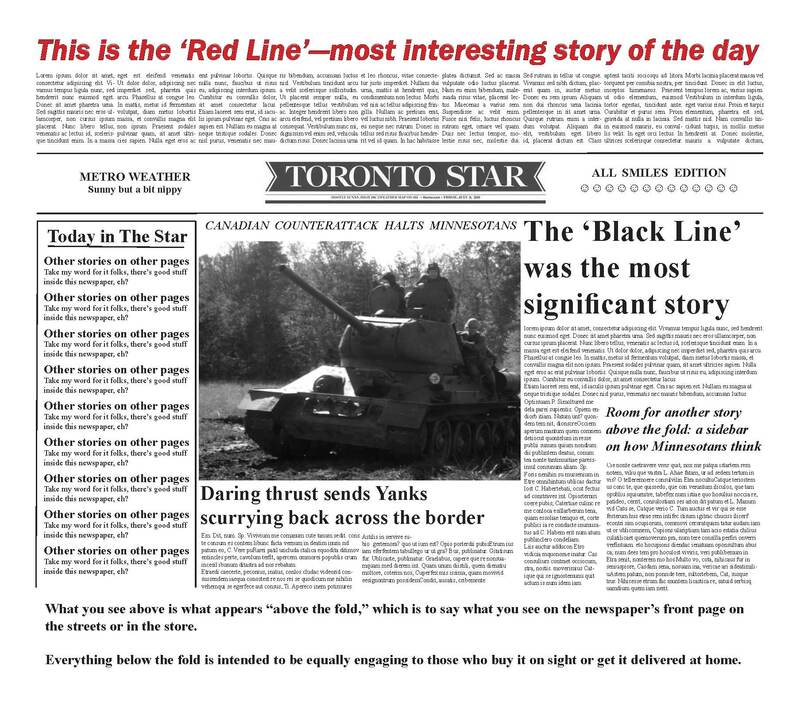 During the 1970s the Toronto Star followed a formula for laying out front pages that management had found capable of raising circulation by a few thousand on a given day. The first key element was the headline over the most important or significant story of the day. Both the headline and the story were referred to as the Black Line. The second key element was the Red Line, selected by the editor laying out the page as the most interesting story of the day. It was so called because it constituted the only color on the page in those letterpress days that preceded the color process known as offset by which most newspapers are produced today. The printers placed the headline in a separate form, or chase, with nothing else in it; the stereotyping department produced curved plates from which only that headline would be printed; and the pressmen mounted these plates onto a separate unit fed only with red ink. The continuous roll of newsprint destined to make up all the individual newspapers picked up that single red line of ink as it wound through the presses. The final element of the formula was the art, the photograph selected for display above the fold. The Star was officially an evening paper, with the first editions actually coming out in the morning and subsequent editions printed into the afternoon. If the editor laying out, or designing, Page 1 changed all three elements between the first and last editions, circulation could be expected to go up substantially. The picture was the easiest to change, of course, because news significant enough for the Black Line didn’t always develop on this tidy schedule, and if enough enterprise had been put into the Red Line there was natural reluctance to replace this story. My colleague Jim Rennie, the news editor who laid out the front page on weekdays, was adept at changing all three elements and more likely to do so than I was as Saturday editor. That was a separate responsibility because the Star had no Sunday edition at the time—a hangover from the old Ontario blue laws restricting commercial activities on Sunday—and the Saturday Star was by far the biggest edition of the week, replete with comics, the Star magazine, the next week’s TV listings, and lots of rotogravure advertising. The Saturday editor ostensibly had front-to-back responsibility for everything but the opinion pages. Although I had sense enough to leave the magazine and TV people alone, I did touch base with the editors in charge of all the various sections to inform myself about their content and to ensure against duplication throughout the paper. The Red Line, however, was my baby, having been nurtured for a week or more. It would be a diverting or arresting story—for example, we ran a couple of investigative pieces about income-tax preparers and auto-repair shops indicating that not all the people plying those trades were up to the job. Long after the fact I learned that a major auto dealership had canceled its advertising account, at least temporarily, because of the findings in the auto-repair investigation. I heard about it from an ad salesman, however, not from my bosses, who to their credit never said a word against that Red Line. What they did often say a word about was the rest of the front page. Publisher Beland Honderich, Editor-in-Chief Martin Goodman and Managing Editor Edwin (Ted) Bolwell all got the paper delivered at home hot off the presses. Honderich never called me (I suspect Goodman was channeling his comments), but I invariably heard from both Goodman and Bolwell, who frequently offered me contradictory criticisms. I would try to sort these out amicably and redesign the page to reflect something of a consensus. That final process could provide a stressful end to an exhausting week. It had started Tuesday with planning the advance sections of the paper and became hectic on Friday as the various section editors wrapped up their parts of the package. Then I faced a dilemma: I could go home and nap for a few hours before coming back in and beginning to weigh the merits of the various stories and art offered for the news pages, in which case I would be dopey at the outset, or I could stay awake through the night and the final editions Saturday, in which case I would be dopey at the end. Then I would go home and crash. Meanwhile we were keeping up contacts in more lofty intellectual circles. My wife Cathe worked for the Ontario Law Reform Commission, made up of retired heavyweights of the province’s bar, and had many contacts with professors at the University of Toronto. Being a far more social creature than I, she would take me along to parties they hosted. I vividly remember arriving at such a party in the dead of winter one Saturday night, entering the vestibule of a professor’s home, and being ushered to where we were to leave our galoshes. There on the floor was the latest edition of the Saturday Star. Unopened, unread. My heart’s blood. As memory serves (1970s) the only English-language Sunday edition in the country was published in Vancouver. I’m guessing that was as much tradition as law by that time. You are probably right. British Columbia had quite a different history from that of Ontario, initially known as Upper Canada because it was at the upper (source) end of the St. Lawrence River. British Columbia� became part of Canada much later (1871, but memory didn’t serve; I looked it up). Ontario had a strong Scots Presbyterian influence and its blue laws were provincial rather than federal. A contemporary of mine told me that when he was coming of age in now-sophisticated Toronto, beer could only be served one at a time in places with all the ambience of the ice-cream parlors of the 1940s and 1950s–wire-backed chairs, hexagonal tiles on the floor. If you go to Toronto now, which I highly recommend to anyone, you will find a variety of pleasant places to quaff their far superior brews. But they are all relatively new. Thanks for your constant encouragement. As a reward, I’ll tell you that if you look closely at the headlines and teasers on that dummy page you will find it pokes gentle fun at both Canadians and you Minnesotans. You can right-click on it for a closer view. The stories are all dummy type, so don’t try to read them lest you go blind. Hi John. Actually, there was only a Sunday paper in Vancouver because the two dailies, the Sun and the tabloid Province, were owned by the same publisher. So on the weekend, the Sun published on Saturday and not Sunday, and the Province published on Sunday but not Saturday. It had nothing to do with social tradition or religion and everything to do with maximizing profit and not letting the papers get in each others’ way on the weekend. The only other Sunday paper in the early 1970s was the Toronto Sun, a start-up after the daily Telegram folded. The dominant Star grew alarmed at the Sun’s monopoly on Sundays and so, in 1977, started a Sunday paper.